Will is shown signing a paper, with six illegible signatures visible. Several versions of Shakespeare's signature exist, all of which are different. This has led to debate about whether William Shakespeare may actually have been illiterate. Continuity: When Romeo drinks the poison, he first opens the bottle, says what he has to say and in the next shot he opens the bottle again before he drinks the stuff. I went to see this movie not knowing what to expect. 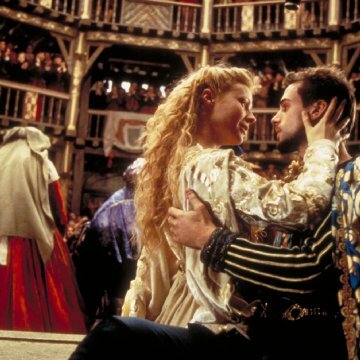 On the one hand, I was excited, because you see, I am an English major and here was this movie based on the life of William Shakespeare. 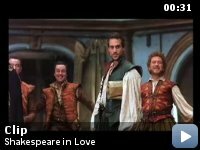 In the realm of Shakespeare rip-offs (i.e., "Romeo & Juliet," "Macbeth," etc..)"Shakespeare in Love" clearly stood out. This is the first film I've seen based on the author, rather than his work. And it was a refreshing change from watching the pompous over-fed Hollywood egoes trying to pass themselves off as true actors. At the same time, however, the casting had me a bit nervous. 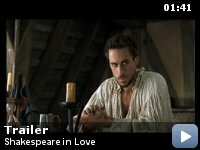 I had not seen Joseph Fiennes work, but I had high hopes since his brother is, in my opinion, a brilliant actor. I liked Gwyneth Paltrow in "Emma" and "Sliding Doors," but I was wary to see how she would pull this one off. And as for Ben Affleck.. well, I was truly afraid he would flop. I saw him in "Armageddon" and immediately racked him up on the list of other such forgettable actors as .. well never mind. The point is, I was afraid he would make a laughing-stock of this movie. As for the other actors,I did not recognize any one else except Judi Dench, and I figured hers was a bit role, nothing that could affect this movie much. I was wrong on almost all counts. Gwyneth Paltrow was so radiant in this movie, she fairly set the screen ablaze. I never knew she had such range. I had not expected such fire in her, I always thought she was a rather calm actress, incapable of such passions. 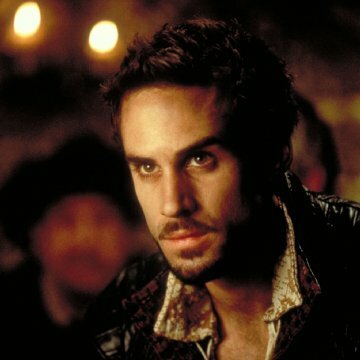 Joseph Fiennes amazed me far more than his brother in that he knows how to balance wit and passion, joy and sorrow gracefully, even more so than Ralph. Together, these two actors did more than carry off the film; they raised it up to levels higher than any other actors I've seen in a very long time. 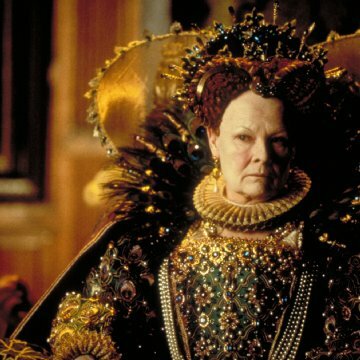 Judi Dench may have had a bit role, but she managed to make a lot out of it. She played Queen Elizabeth with more majesty and grace than any other Queen-playing actress I've seen. (I've yet to see Cate Blansett in the movie "Elizabeth. ")But the true darkhorse of this movie is Ben Affleck. My God, he has a sense of humor! I never imagined. "Armageddon" didn't give him much space to roam in, but in this film he was all over the place. Had he not been flanked by such worthy thespians, he just might have stolen the show. The actors could not have done such marvelous work had it not been, of course, for the writing. The play flows smoothly, with nary a glitch in sight. This is note-worthy, for it is well over 100 minutes. It is written in a style that is at once clever and grave, passionate and dry. Love is one of the most abused notions on the screen today. It is rare to see a movie portray Love with as much originality and truth as this film has accomplished. Perhaps the highest compliment I can pay this movie I already did on Christmas night, when I went to go see this film. As the movie ended and the actors' names scrolled up on the screen, tears trickled down my cheeks. I must say it is not often a movie makes me cry. And don't underestimate me just because I am a girl and because I may be more sensitive because you see, my boyfriend left the theater with suspiciously bright eyes as well..